Maybe Invasion is a bit strong of a word, but lately I have been seeing a LOT of Egrets. Sunday in the showers when I was walking under the overhang of the Gables Wilton Park on Wilton Drive, I encountered this Snowy Egret doing exactly the same thing. I was keeping dry in the downpour and managed to follow it the length of the building acting like a Nature Photographer snapping off digital shots the entire time. This bird didn't seem to be threatened by me but did keep a healthy distance away. 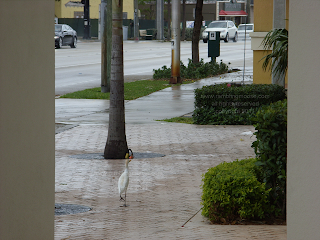 Once I got to the end of the building just before the little triangle that my border collie likes to fertilize, the egret pealed off to the left and walked back under cover via the last parking space. I think he got tired of smiling. Somehow, as an advertising slogan, I don't think that will take off!